WICKENBURG – As an internist at Wickenburg Community Hospital Clinic, Dr. William Firth winds up diagnosing and treating hundreds of ailments, from poorly managed diabetes to rheumatoid arthritis pain. 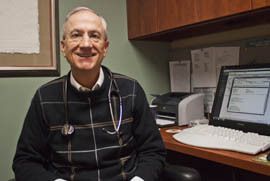 Down U.S. 60 in the Phoenix area, a primary care physician may simply refer many of the cases he handles to specialists. Like many Arizona communities, Wickenburg is considered a primary care health professional shortage area as defined by the U.S. Department of Health and Human Services. Such communities have a population-to-primary care physician ratio of no less than 3,000 to one. The Arizona Department of Health Services estimates there are 141 primary care shortage areas, 94 mental health care shortage areas and 154 dental care shortage area across the state. 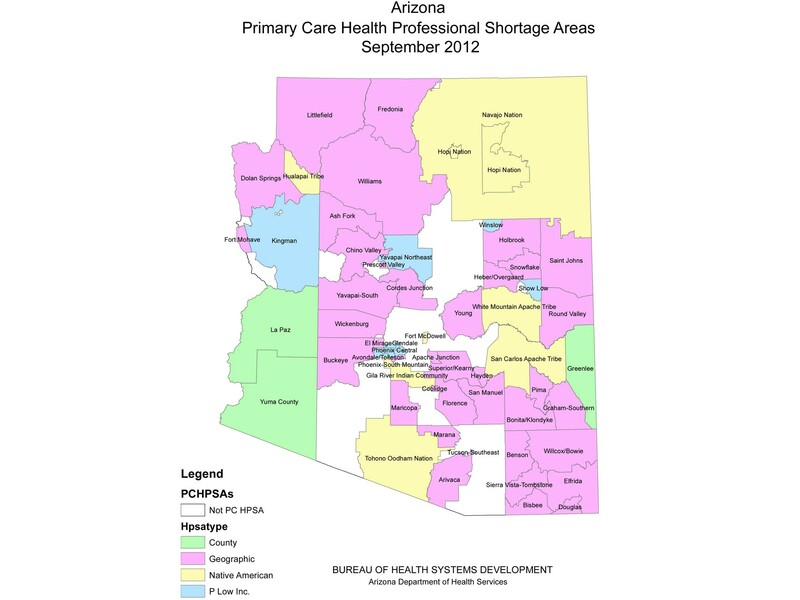 To remedy that, Arizona would need an additional 313 primary care physicians, 250 dentists and 136 psychiatrists. Experts predict the problem will only get worse under the Affordable Care Act with Arizona expanding Medicaid and many more residents becoming eligible for health insurance. Dr. Michael Grossman, associate dean for graduate medical education at the University of Arizona, has been researching the state’s doctor shortage for several years. He said the problem can be traced back to forecasts in the late ’90s that the state was actually producing a surplus of doctors. To begin correcting the shortage, Grossman said the state’s medical schools had to expand. In the past five years, the University of Arizona College of Medicine added a campus in Phoenix and is now on pace to produce enough students to meet the state’s needs in the next decade, he said. However, he said, on order to produce health care professionals who can practice medicine without supervision, the state also needs adequate residency programs. According to Grossman, Arizona falls in the lowest quartile of states with about 20 medical residency slots per 100,000 people. Medicaid and Medicare provide most of the funding for residency programs in Arizona. But Grossman said a state’s federal funding is indexed to caps that were established in 1996 and are difficult to change. That prevents many hospitals from adding more residency spots, he said. With a goal of producing more physicians to serve rural Arizona, Yuma Regional Medical Center is launching a residency program on July 1. Dr. James G. Lenhart, center’s program director of family and community medicine, said it took five years to get the program started. The hospital will accept six students to the program this summer, but Lenhart said it will cost the hospital three times more to educate the students than Medicaid reimbursements cover. He hopes the program will bring more doctors to Yuma, which qualifies as a medically underserved area, and estimates that 50 percent of those who complete residency in Yuma will stay after graduating. He hopes the other half will at least stay in the state. To encourage medical students to pursue work in underserved areas, both the state and federal governments offer loan repayments programs for students willing to work in rural areas. Ana Lyn Roscetti, workforce section manager at the Arizona Department of Health Services, said these programs not only incentivize working in underserved areas but also help provide affordable care for lower-income communities. “Being that there’s 1.2 million uninsured in Arizona, you can imagine that cost is really an issue,” she said. Roscetti said all the workforce development and loan repayment programs require both health care providers and their employers to offer a sliding fee schedule to meet the needs of patients of all income levels. But she said providers and educators should do more to expose students to rural and underserved areas and make the public aware of the state’s doctor shortage. Dr. Carol Q. Galper, assistant dean for Medical Student Education at the University of Arizona, oversees the medical school’s Rural Health Professions Program. The program, created in 1997 by the Legislature, requires the state’s public universities to send a number of medical, pharmacy and nurse practitioner students to rural areas for a month. Galper said the program helps students better prepared for the demands of rural medicine. Doctors in underserved areas often face higher volumes of patients and can’t always rely on second opinions, Galper said. University of Arizona medical student Rene Franco Jr. said his personality and small town roots make him well-suited for rural medicine. His participation in the Rural Health Professions Program will give him the skill set he would need, though Franco said he’s not sure the experience was enough to make him stay. Dr. William Firth, an internist at Wickenburg Community Hospital Clinic, said working in a rural area has its own rewards. Wickenburg is among areas in Arizona that have shortages of doctors. 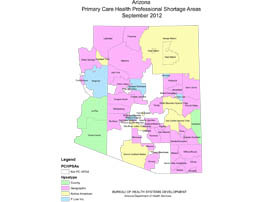 See a map of Arizona that have shortages of physicians.